The beach is now closed due to construction work on the Dubai Canal. The park area will remain open until the end of December 2014. The beach and park are expected to reopen by the end of 2016. This stretch of coast line in Jumeirah is by far the nicest park and public beach in the city. It attracts both locals and visitors staying in the city centre hotels. The beach itself around ½ mile long and wide enough to ensure it doesn’t get too packed. Sun loungers and umbrellas can be hired and lifeguards are on duty from 8 am until sunset. The grassy area behind the beach offers plenty of shaded areas, barbeque facilities, and a children’s play area. Jumeirah Beach Park is situated on Jumeirah Beach Road, in the heart of Jumeirah and close to Safa Park. It’s open every day of the week from 8 am until 10 pm. Entrances costs 5 AED per person or 20 AED per car. Mondays and Wednesdays are women-only days. There are no Metro stations within walking distance of the beach but several buses stop near the park. These include the number 8 service from the Gold Souk Bus Station (near Palm Deira Metro Station) to the Ibn Battuta Mall, and the F16 feeder bus from the Burj Khalifa Dubai Mall Metro Station to Jumeirah. Map showing location of Jumeirah Beach Park. 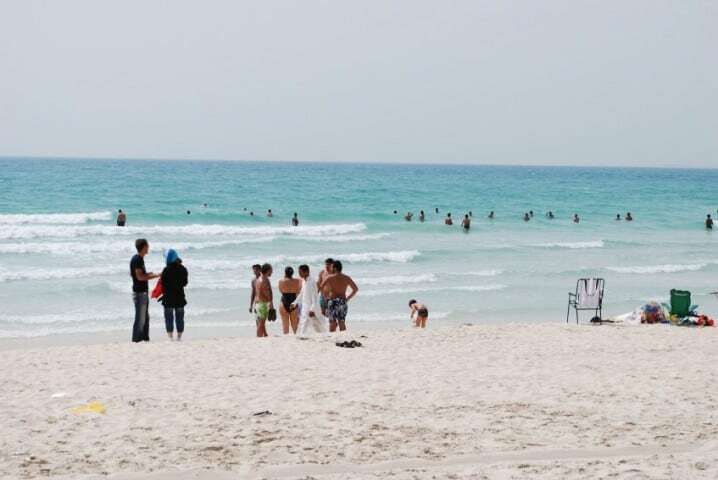 Good facilities for Dubai, where most of the beaches are private or belong to hotels. You need to pay but there is a playground, barbeque areas, changing rooms, and lifeguards. This was a nice beach with good facilities. Entrance was only 5 dirhams. You can rent umbrellas and beach chairs too. There was a café serving basic food. It was nothing too fancy but quite tasty. If you are going with a man don’t come here on a Monday or a Wednesday as these days are only for ladies.